We deliver staff augmentation and services while delivering expert administrative, planning, analyzing and scheduling inspection and management services necessary to complete your important projects. We deliver corporate training, lead professional coaching, and facilitate assessments and 360-degree feedback sessions. Our trainers and evaluators are skilled at creating solutions for each customer aimed at creating awareness, generating action, and facilitating learning and growth. such as content or learning management systems for customer success. TBS coordinates and conducts IPRs and research-collaboration meetings with leaders, staff planners, and resource managers of those units and organizations to educate them on the importance and value of their participation in research, and to update them on the pre-transitional progress and findings of the research. TBS submits recommendations for design and development of exemplar training, training resources, and job aids. Topsarge Business Solutions, Creating Change one Leader at a Time. We develop and deliver customized training that is ADDIE-compliant, conducted executive coaching, assessments and 360-degree multi-source surveys. Specialize in social interaction, web design, community facilitation and custmer relastions management tools. We create strategies on how to best use digital tools. 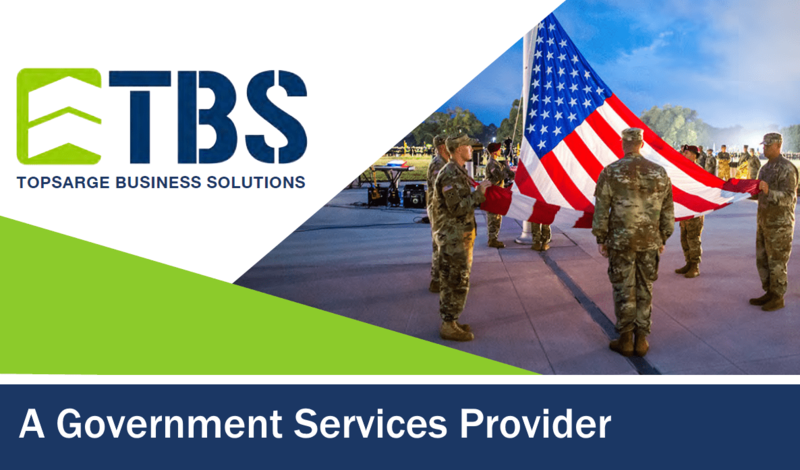 Topsarge Business Solutions (TBS) is a Texas-based professional services company who provides technical services, professional training, research support and online and web services to our federal, state and commercial clients from our offices in Killeen and Austin. We do that by using our award-winning team to provide high quality service and support that focuses on managing projects with pride. We are privately held limited liability corporation that offers a wide variety of technology and management services, our reputation is our strength.